Shop > Blog > Rock your biceps! Forward to the victory! Today we will talk about the foundation, which should be laid, namely about the complex of exercises for biceps, which you will still pierce the biceps by doing. 1) Biceps workouts will be done once a week with triceps. But we will change the sequence in the exercise: in one workout we start with the biceps, on the other – with the triceps. It is worth considering, when training for biceps, that the schedule of weekly training sessions on arms and back should be correctly built. 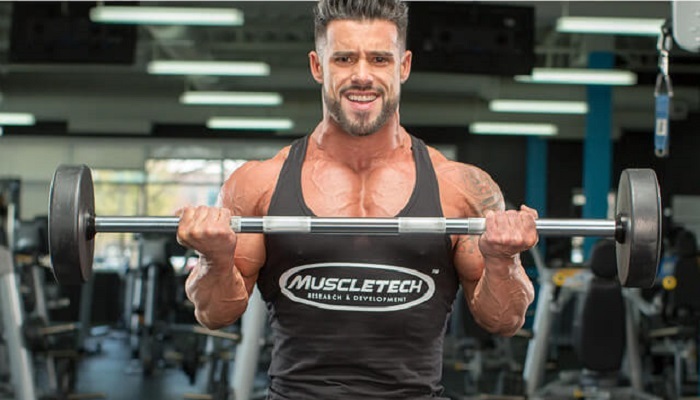 This is due to the fact that during pumping back, biceps performs a supporting role. Therefore, it is wrong to swing your back after the day of loading the biceps. You just can not. Swing your back today – give your biceps three days to rest. We decided today to take up the training of hands – on the back we hold a training session in two days. Consider this, this is an important point. 2) Do not rely on large weights, there is no hope for them! We need isolation. If you take a big barbell, it means that with such weight not only the biceps, but also the back and legs work. In isolation, your biceps is unlikely to take the weight that you lift with the efforts of your entire body. Tune in to an isolated job. 3) Without the “hammer” we can not do. The position of the hands in this exercise involves the shoulder muscle, which is anatomically located under the biceps, and in contrast, it only helps to flex the arm at the elbow joint. In this way, we will visually increase the thickness of the arm. 4) Forget the jerks. Do exercises at a moderate pace. In the middle of the amplitude of movement, you should pause. If you can not, this is a signal that the weight you have chosen is too big for you. Reduce weight! Do not be fooled by the weight, lead and work the scales correctly. 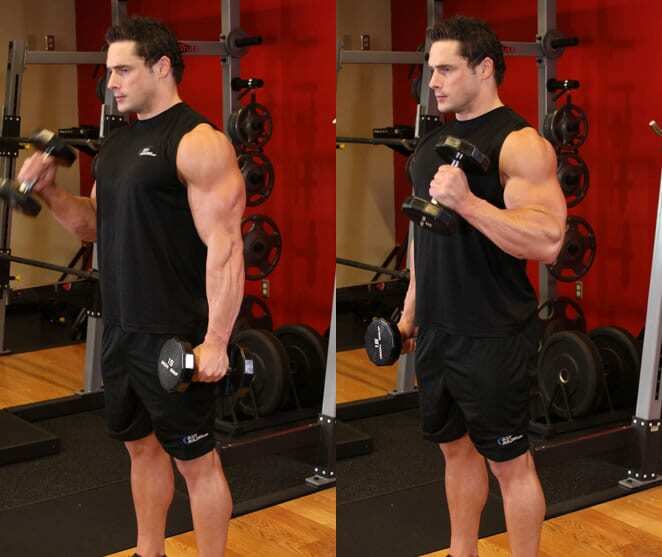 5) Alternate lifting with dumbbells – this is what the doctor ordered for the biceps. Changing only the position of the palms in this exercise, you diversify your training. The palms in line – on the inner bundle we work, at an angle – on the outer, parallel grip – we turn on the shoulder muscle. 1) Lifting barbell for standing biceps. We perform in 4 sets of 15, 12, 10, 10 repetitions. We stand straight, straighten our shoulders and back while inhaling. Slightly lifting the bar, push your elbows to your body. Then we make the lifting bar, without jerks, slowly. When performing this exercise, your elbows should be pressed against the body at all times. Therefore, we lift the barbell until we can keep our elbows pressed. Returning to the starting position is also slow. “Masters” – lovers manage to perform this exercise to the collarbone, literally throwing the barbell. But so they lose all the technique, make jerks, and tear their elbows from the body. Do not repeat the mistakes of others. 2) Back lifts EZ-bars from the bench. We perform in 4 sets of 15, 12, 10, 6-8 repetitions. On the Cattle bench, rest your belly and chest, in your hands – EZ-bars, lower your arms and arms. Slowly, bending the elbows, raise the bar to the parallel, make a stop. We return to the starting position even more slowly. Watch out for brushes. They should not walk with you, should be straight, do not turn them up or down. The exercise is aimed at working with the lower biceps ligaments, so add weight gradually. Start with a little weight to avoid injury. Perform in 4 sets of 10-12 repetitions. In the standing position, shoulders and back straighten, arms with dumbbells hold the seams. Breathe in and bend the elbow slowly. Elbow should not walk, lock it in a fixed position. And remember: we raise the dumbbell on the force, we do not swing it. To achieve even greater effect, when lowering the arm to the starting position, leave the arm with the dumbbells on weight, so you will keep the tension in the brachial muscle. 4) Lifting dumbbells sitting (alternately). We perform in 4 sets of 10, 8, 8, 6-8 repetitions. Sit on the bench, lower your arms with dumbbells along your torso. With the palm turned outward, slowly raise the dumbbell to the shoulder girdle. We return to the initial position only when you feel a reduction in the upper point of the biceps. At the same time expand the palm inside. Do not help yourself on the rise of the case. Connect the foot and keep the balance for cleanliness. If the foot width – the body is included in the work on the machine.